The Sudbury Wolves will be busy in the community this week with several appearances planned around their double-header weekend. Thursday night, select members of the Wolves will visit the Home Depot Backyard Rink winner Jamie Sutton in Garson. 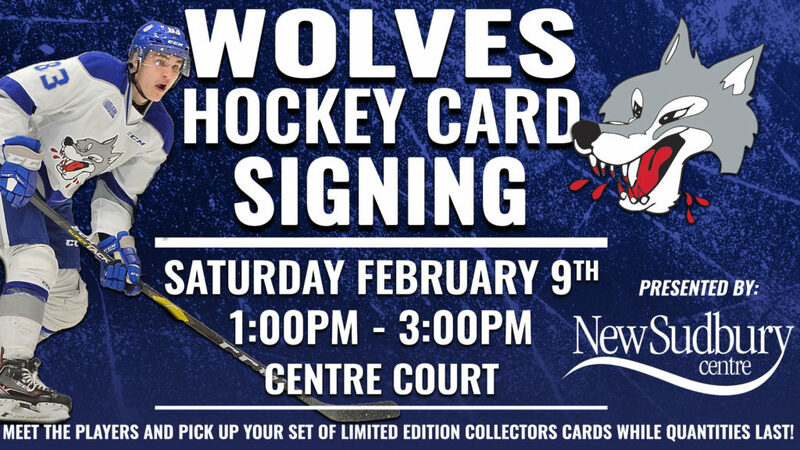 Saturday, the Wolves have a full community day planned with stops at CTV Pond Hockey on the Rock from 10am – Noon on Ramsey Lake and at the New Sudbury Centre for the annual Hockey Card autograph session from 1:00pm to 3:00pm at Centre Court. Come meet your 2018-19 Sudbury Wolves and pick up your free set of hockey cards while supplies last. The Wolves will hit the road Wednesday to visit the Sault Ste. Marie Greyhounds at 7:07pm before returning home Friday to host the Flint Firebirds. Greta seats are on-sale now at the Sudbury Arena Box Office or online at sudburywolves.com.